Camdyn McLeod watches his putt on the 9th green in a match Thursday at Calvert City Country Club. 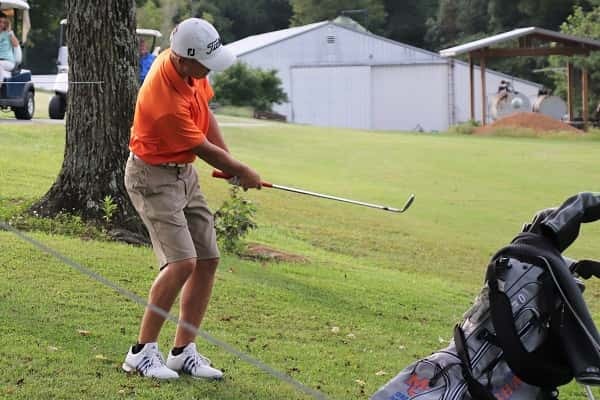 The Marshall County boys golf team hosted a nine hole match at Calvert City Country Club (front nine par 36) on Thursday afternoon. The Marshals came away with the victory over a very good young St. Mary’s squad winning 150 to 162. Calloway County also played in the match but only had three players so no team score was recorded. Clayton Bobo led the Lakers with a 39, followed by Ty Gallimore’s 41 and Daniel Bowden’s 46. Individual medalist honors went to the Marshal’s, Jay Nimmo who shot a 3 under par, 33. Nimmo’s round included 4 birdies, 1 bogey and 5 pars. Camdyn McLeod continued his consistent play with a one over par, 37 followed by Tyler Powell’s 39, Drake Butler’s 41 and Nathan Clark’s 45. 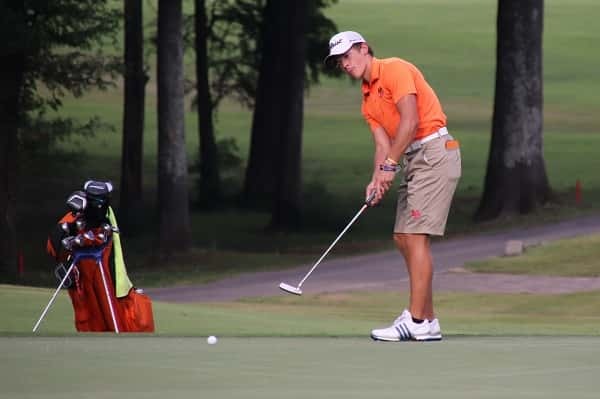 Other Marshall County scores came from Nick Dowdy 43, Trey Wall 45, Teddy Wynn 46, Hayden Powell 46, Ben Staples 47, Preston Futrell 49, Hunter Anderson 49, Tate Scillian 54, David Jack Morris 54. The Marshals travel to Union County on Saturday to participate in the Union County Invitational at Breckinridge Golf Course. Drake Butler chips onto the 9th green at Calvert City Country Club in the Marshals match Thursday against St. Mary.